Dr. Guillermo Arroyave graduated from University of San Carlos de Guatemala (Pharmacy) (B.S. 1947), Massachusetts Institute of Technology Cambridge, Mass. (Nutrition Food Science) (M.Sc. Level 1948) and University of Rochester Medical School (Biochemistry), Roschester, N.Y. (Ph.D. 1953). He joined the international, Vitamin A Consultative Group (IVACG). Nutrition Foundation. He also was a member of Technical Advisor Group. International Science and Technology Institute and Vitamin A Field Support Project (VITAL). 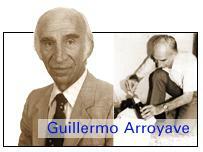 Dr. Arroyave came to Guatemala in 1949 as the first professional in the newly founded Institute of Nutrition of Central America and Panama and established the first nutritional biochemical laboratory in Latin America to use micromethods, newly developed in the United States, for the evaluation of the nutritional status of human populations including children. These methods permitted analysis of multiple nutrients in finger-tip samples of blood and thereby include children in such studies. This made it possible for the first time to characterize reliably the nutritional status of Central America populations. He then trained many persons from developing countries in his laboratories and thus made these methods widely available for the first time. Dr. Arroyave’s pioneering efforts for national fortification of sugar, show dramatic reductions in the prevalence of low serum retinol in Guatemala and Costa Rica that their peoples have implemented fortification of sugar. Other countries in the region are now implementing or plan fortifications programs based on the Guatemala experience. As a result, many women and children, indeed entire populations, have has the risk of mortality from infectious diseases reduced because of their improved vitamin A levels. In the early 1970s he did the basic studies necessary to set the stage for the fortification of sugar with vitamin A. He worked through technological problems, conducted field surveys to establish levels of intake of sugar by vulnerable groups, worked with the private industry to convince them to pooperate in producing fortified sugar, lobbied politicians to obtain their support for a national program. So Guatemala became the first country in Central America which has a national fortification program. This model is now influencing many other countries in their fight to control vitamin A deficiency. It was nearyly two decades that the importance of his contribution is recognized and UNICEF, WHO, USAID and others are helping to extend this approach to other countries outside the region. Meanwhile, sugar fortification with vitamin A has been revived in Guatemala and several other Central America countries.